Finally - boy this Lent has been a difficult one for me. It came early this year, and my disciplines were interrupted due to my Dad's illness, but now that the Lent is past, my mind has turned to Resurrection, this Easter week. 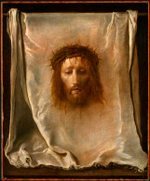 What does Resurrection mean to me? I mean really, how has Jesus' rising again changed me, or has it? In what ways have I been and am I being overtaken by its reality? The people of His day knew death FAR more than our overly sanitized culture today. They knew that once a person died, nothing in this world could change that cold, final fact. Then.. Jesus’ Resurrection! I think it wasn’t so much a doctrine for the early Christians as it was the real experience that brought life and hope to a shattered community. Resurrection changed them forever and universally. This past Easter Sunday morning as the beams of the rising Sun streamed through the clouds of incense over the beautifully flowered Altar during Mass, I was struck by the glorious sight, and realized this is but a shadow of the Glory those we love but see no longer now behold. How can I live a Resurrection life? If nothing else, the Resurrection affirms that God is in control and has the last word. And in Jesus Christ, His Son, God revealed that His first and last Word is love. Archbishop Williams has written an essay called "Between the Cherubim: The Empty Tomb and the Empty Throne," and has suggested that imagery of the Ark of the Covenant might help us modern Christians understand early Jewish thought when confronted with the emptiness of Jesus' Tomb. This is a somber day a day of Sabbath rest. There is no Eucharist - Christ has been taken away from them and from us, His Church. We are alone and in our prayers and thoughts. However we are compelled to connect with His small band of family and disciples, as they and we experience the shock of loss and dark despair. This is a darkness, an unthinkable horror that modern Americans simply do not want to face, yet clearly the Gospels teach that His followers walked through this time, and we who follow the Apostolic teaching walk this path along with them. There is a time and season for every thing under the sun, and this is the time when our Lord lay, cold and dirty and dead. Lifeless as His followers' hopes and dreams. Here it is. Friday of Holy Week. For the disciples it is a time of ultimate disaster. Jesus was taken by force the night before, now an illegal show trial and he is condemned to die a public, horrible death. What went wrong? The profound shock and despair is beyond words. Wasn't God with this man? 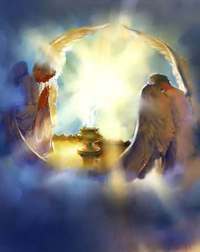 Yet, He sends no Legions of Angels to pull Him down from the Cross. Darkness covers the land, and all is lost. The horror is unimaginable, the grief and sadness is over whelming, but more than that, He did it for me... I and my own sin put Him there, on that Cross, in that Tomb. On Ash Wednesday we started a journey that will be competed here tonight. The new journey we start tonight does not end until the Resurrection of Easter. In ancient times this time was called the Triduum, "The Three Sacred Days," which lead us to Easter: Maundy Thursday (with it's all night Vigil of the Blessed Sacrament), Good Friday, and Holy Saturday to prepare us for the glorious celebration of the Resurrection. Tonight as we are leaving Lent, and enter the Triduum, we will see the theme of love, our Savior's love for us. We will follow Him as He expressed that love in the washing of the disciples' feet, in giving Himself in bread and wine, in His dying upon the cross. We will confess our sins, but unlike Ash Wednesday, the focus is on absolution. Forgiveness comes now "in the name and by the command of our Lord". In fact tonight we read of the new commandment, to "Love one another." On this, the very night of His betrayal, Jesus gave His disciples a new commandment: to love one another as He had loved them. We say our prayers The Altar is made ready. The time of the Lord's Supper arrives, and our Lord is revealed in bread and wine as once He "revealed Himself to His disciples." Jesus, fulfilling the promise of the Paschal Lamb, gives us the Eucharist, as He, like the Lamb, will be killed and eaten by His own people. As much as we would like we cannot linger at the Table, for His betrayal is upon us. Before we know it, the dramatic scene of His betrayal is played out before our eyes. The symbol of Christ in our midst, the Altar, is stripped bare. The Gospel banners are removed from the Nave, the last ornaments removed from the Sanctuary, and the Reserved Sacrament removed from the Tabernacle. Christ is stripped of His power and glory. He is taken from us, we are destitute and despairing, Good Friday is inescapable. The powers of darkness are at work upon Him. We leave this place in silence; this night there is no benediction, no blessings, only despair. Like the disciples on that dark night long ago, we scatter in the darkness - at least we know that it is tonight that our Salvation is wrought. Lent is ending, Holy Week is upon us, the Church seasons are turning, Redemption is right around the corner. We approach the end of Lent with the knowledge that we often have not kept our Lenten disciplines as well as we would have liked. Perhaps one of the values in keeping them is not in keeping them perfectly, but there is value in failing at them...that it's at that point when we've fallen flat on our faces, when we're lying there bruised and breathing in the dirt, that we find ourselves in a place where we can meet the Christ Who fell under the weight of His cross; Who knows what it is like to fall. Julian of Norwich tells us that "..He allows some of us to fall harder and more seriously than we have ever done before, as we imagine. And then we suppose that we are not entirely wise, and that all we have begun is nothing. But this is not so. For it is necessary for us to fall, and it is necessary for us to see it." This week, the week that forever changed our world, we walk with Jesus from the highs of Palm Sunday through the shadows of Maundy Thursday, the shock and pain of Good Friday, to the heartbreaking despair of Holy Saturday. But we yet have a great hope; as the Light breaks on Easter Sunday, we will meet Him again, alive, One who knows our falleness, yet still calls us to Him. So we also will know that "things which were cast down are being raised up, and things which had grown old are being made new", and that all things are being brought to their perfection by Him through whom all things were made, Jesus Christ our Lord. Come with us, walk with Him, this blessed, Holy Week. Patrick of Ireland 17 March 461 A. D.
Today we remember the man who many only think of once a year, with cute shamrocks, leprechauns and green beer, but I think he was so much more than that! Patrick was born some where around 390 in south western Britain, possibly between the Severn and the Clyde rivers. We know that his Grandfather was a priest, and his family were citizens of the Roman Empire, which in those days was very important. As a young man, he says that he cared little for God or His ways. But then, when he was around 16, he was kidnapped by Irish pirates and sold into slavery in Ireland. This was a horrible and brutal experience, one that I can only imagine. It is particularly hard to understand how he went from a civilized Roman Province, to a wild barbarian land, with no laws or protections. We simply don't really have anything to compare our lives today with what happened to him, but in his despair, as often we humans do, he turned to God for help. And just as often, God hears us in our weakness, and Patrick escaped after about six years. He made his way to a port, and some how persuaded some sailors to take him back to the British coast, where he made his way home to his family. Patrick returned to his family a changed man, and began reading the Bible and started preparing for the Priesthood. The Spirit moved in his heart, and he could not forget the people he was enslaved by. Patrick chose to NOT take the way of anger, hatred and revenge on his captors, and by forgiving those who had so cruelly sinned against him, Patrick changed the history of the world. He was eventually ordained a Priest by St. Germanus, the Bishop of Auxerre, under whom he had studied for some years. 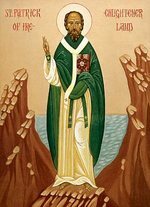 Shortly after 433 or so, Patrick was ordained a Bishop and made his vocation to be missionary to the Irish people. Patrick began preaching the Gospel all over Ireland, and started the conversion of the Irish people. He was many times in danger, among people who were pretty much savages, and often times not only not welcoming, but down right dangerous. Nonetheless, Patrick and those who followed him began building churches, and preached throughout the country. They often converted Kings and their families, helping entire kingdoms to see the Light of Christ. That is how Patrick changed the world, because a soon the Roman Empire fell in the West, and learning and knowledge were snuffed out. That is all but in Ireland, where the newly illiterate Monks carefully recorded and transmitted what information they could throughout the dark ages. If not for the Irish Monks, the Western world would have lost a great deal of its knowledge and literary heritage. After about 40 years of preaching, teaching, and building Patrick wrote of his love for God in in his life Confession. Then, after years of living in poverty, traveling and enduring much suffering he died on March 17, 461. He died where he had built his first Church, the town of Saul. Patrick was a humble, pious, gentle man, whose love and total devotion to and trust in God is an inspiration to me, and I am glad that our Parish should have such an example as our Patron. Patrick did not fear anything, not even his own death, so complete was his trust in God, and of the importance of his mission. So, why the Shamrock? The Celtic people were much closer to nature than their Roman counterparts back in the Empire, so Patrick used a simple shamrock to explain how the Trinity can be Three and One. Ever since, we associate the shamrock with him and the Irish people. Almighty God, Who in Your providence chose Your servant Patrick to be the Apostle of the Irish people, to bring those who were wandering in darkness and error to the true light and knowledge of You: Grant us so to walk in that light, that we may come at last to the light of everlasting life; through Jesus Christ our Lord, Who lives and reigns with You and the Holy Spirit, one God, now and ever. Amen. 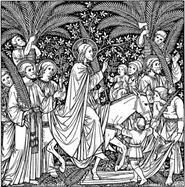 In the tradition of our parish, we read the entire Passion on Palm Sunday. Parts are distributed to the congregation, and we all have the part of the crowd. So, before the morning is over, we journey from the emotional high of the crowds shouting praise, to the horror of the same crowd shouting "Crucify Him"! It is amazing how we humans can turn on someone when they don't meet our expectations. How when they do not fulfill what we want them to do, we become angry and scream out our frustrations at them. Every time I have to say those words: "Crucify Him! ", they send a chill up my spine. I know....had I been there, how very, very easy it would have been to go along with the crowd, and turn on the One Who was the King. So readers, how have each one of us turned on Him this very week? Lent is ending, Holy Week is approaching. As we turn our minds and hearts to the Passion, I want to offer this meditation on the Cross I got from Beliefnet, it is very profound. Two thousand years ago, outside the city-gates of Jerusalem, Jesus of Nazareth was crucified as a common criminal by means of crucifixion. This is the historical fact. Now, the truth of faith: He died for me, and for you. He died for all people. God became a man and lived a relatively short life. That life was ended by means of a cruel arrest and a horrible sentence of torture and death. Our hearts sink heavy with the realization that he died because of our sinfulness. We could not save ourselves. We needed a Savior-a Divine, sinless Savior. 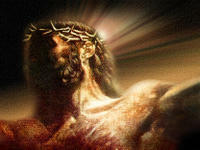 Look with the eyes of faith, and behold this gentle and willing Lamb stretched out in agony on the wood of the cross. Here is a mystery played out so pitifully and yet so beautifully. 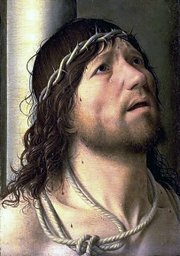 The mystery of love is emblazoned on the suffering Christ as he hangs there in unmentionable agony. Love, not nails, holds him fast to the rugged cross. "No one has greater love than this, to lay down one's life for one's friends." "Do you think that I cannot call upon my Father and he will not provide me at this moment with more than twelve legions of angels?" The cross demands a response. No one can pass it by without making a decision either to cling to it or to ignore it. The cross stands as an unshakable anchor in history. The Church is built upon the foundation of the glorious cross. It is her banner of victory and her hope of life eternal. Hell trembles before the majesty of its truth. The world looks upon it with contempt. However, the Christian knows its value. We know that it contains everything needed in this life and is the gateway to the life to come. If we desire to be made whole we must drive it into our hearts afresh at each moment. The Christian who has forgotten the cross is the saddest of all creatures. The cross is the crowning glory of our faith. Without it in our lives we are the poorest of souls. Therefore, we must hold it fast and treasure it beyond anything else. In the weakness of the cross the strength of God is enfleshed. Those who railed against Jesus to come off of the cross saw before them what appeared to be a weak, helpless man. However, they mocked the strength of God who stayed on the cross, working out our salvation. Look upon the cross and there you will see a powerful Savior mounted on a throne, not a frail man thrown into death at the hands of another. "No one takes my life from me, but I lay it down on my own." The sight of the instrument of our Lord's death must have been a bloody and frightening sight. However, His pain has become our healing. His shed blood has become for us a cleansing river. His death has opened the way for us to enjoy eternal life in the joys of heaven. Why, then, should we not fall down before His cross in worship? We must. We must, in the sight of such awesome love, give ourselves totally to Christ. God forbid that we should walk by the cross and not have our lives forever changed as we glimpse the boundless love of the sinless Christ who became sin for us (II Corinthians 5:21). Therefore, with our whole hearts, we must be reconciled to God by love of the Lord's cross. We must offer ourselves, too, as sacrificial offerings to that love which is supreme, perfect, and infinite. The cross must shine in our hearts and in our lives so that others may see in us the love of Christ. We must die to self and to the world and live in the glory of Christ's cross of victory. Forever may our voices and our hearts swell with the anthem, "Praise to you, Lord Jesus Christ, for by your holy cross you have redeemed the world (Saint Francis of Assisi)!" I am back in Tulsa, and Dad is stable in the ICU. He is on a really exotic medicine that maintains his blood pressure. For the most part, he is pretty lucid, but he had his moments of not understanding what is happening, and what day it is. I can't express how wonderful it is to know that not only my Parish family, my biological family, but my blogging community as well. I do believe it is a community, and I do seek your continued prayers.